The week we’ve all been waiting for is here! The end of the One Room Challenge is always a lot of fun. I’m excited to show off our freshly zhushed guest bath. You might remember from Week One, that we had a plain, builder grade bathroom that lacked personality. I decided to work with the existing tiles (even though I didn’t really dig them) rather than paint or remove them, due to time and budget constraints. I did replace the old counter top, faucet, hardware, mirror and light fixture, but I think the real hero of this room is the wallpaper! It looks great! I adore the wallpaper. Sue, it looks fabulous!! Everything you chose is perfect and I am now wanting to redo our bathroom! Looks fabulous….so glad you held your ground with your paper installer. The wallpaper is incredible! Great job! Absolutely Gorgeous! One of my all time favorite wallpapers too! Sue, it honestly doesn't even look like the original tile anymore. In fact, at first glance I thought you had changed it. It's all so lovely and one of my favorites this year! I adore the bathroom. The wallpaper is so chic in the gray. The hex mirror was such a great choice too! Bravo! What a beautiful space! I love that mirror and amazing wall paper. Congrats on completing this challenge! A lovely little hideaway of a jewel box. Love it Sue, great job!! Beautifully done! And that wallpaper is killer. Bravo! looks amazing, love how the brass accents really add the perfect finishing touch. Great job Sue! I absolutely love the wallpaper, it is subtle but so fabulous! Love the warm grays of the room – congrats on an amazing transformation! This room is beautiful Sue! It's so elegant with a hint of drama. You really made the tiles work! Great job. WAO!!!! Stunning! so, so beautiful!!! You and bathrooms! you always do an amazing job. I almost used that wallpaper in my powder bathroom. And I love the mirror, I used it in my mudroom. Great minds!! And of couse Nicole's photos are the best. Congrats my friend! 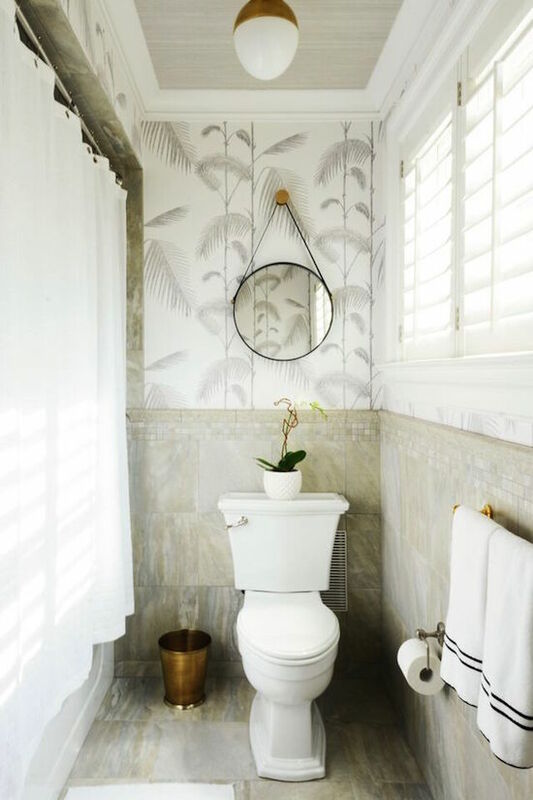 You couldn't have chosen a better wallpaper to mix with the tile and I adore how you also papered the ceiling. Oh and that mirror…soooooo good. I love all the brass of course and how elegant but still playful your design is. Beautiful job!!!! Agree with Christine. Perfect choice. I love how soft and pretty this is but with so much energy and pattern. This is really beautiful. Bathroom envy. 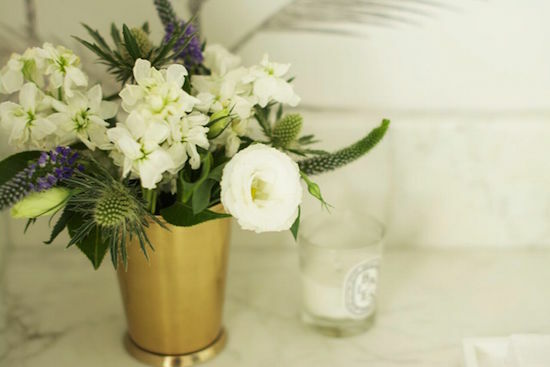 Your powder baths never disappoint! LOVE the wallcovering. Beautiful as always, friend! 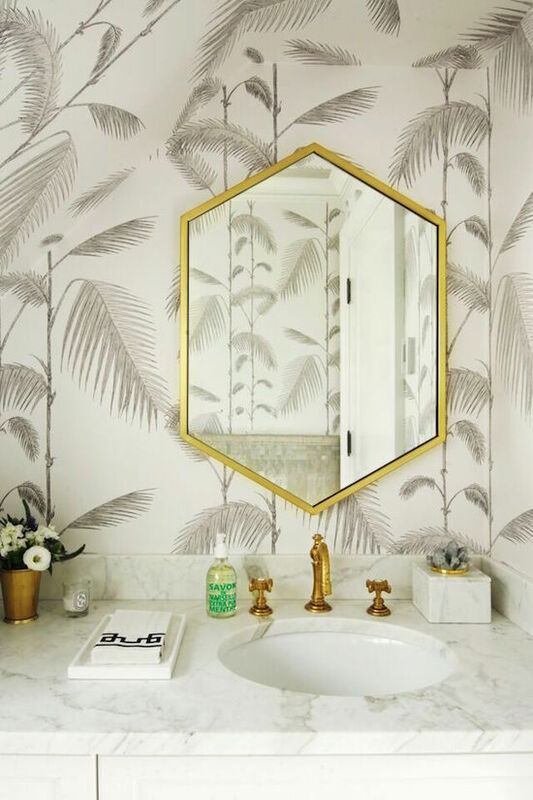 The wallpaper, the hex mirror, the brass…everything is gorgeous! Love it! 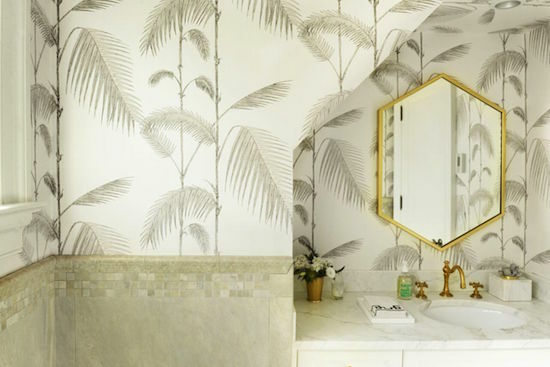 I must have that wallpaper somewhere….it is fabulous and makes the room for sure! Gah….it all looks so good with the tile. Great job! Hello gorgeous bathroom! This is lovely. The wallpaper is amazing. The perfect wallpaper for your tile. I love it. Your brass touches are spot on. This is a lovely powder room. Nice to read that you felt at ease. It looks amazing. 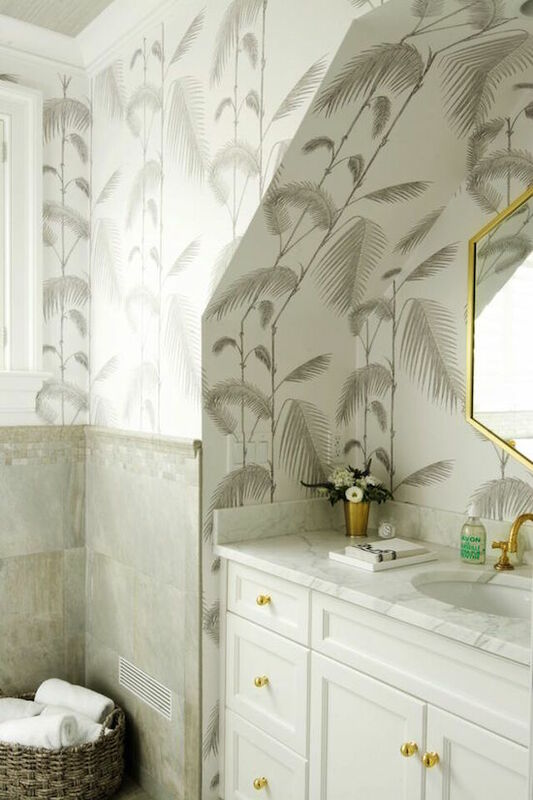 That wallpaper is the perfect choice and I love the marble and brass goodness on the vanity. Great job Sue! So pretty! What a serene space. That mirror was MADE for that space. It turned out great! Absolutely love the hex mirror and wallpaper! 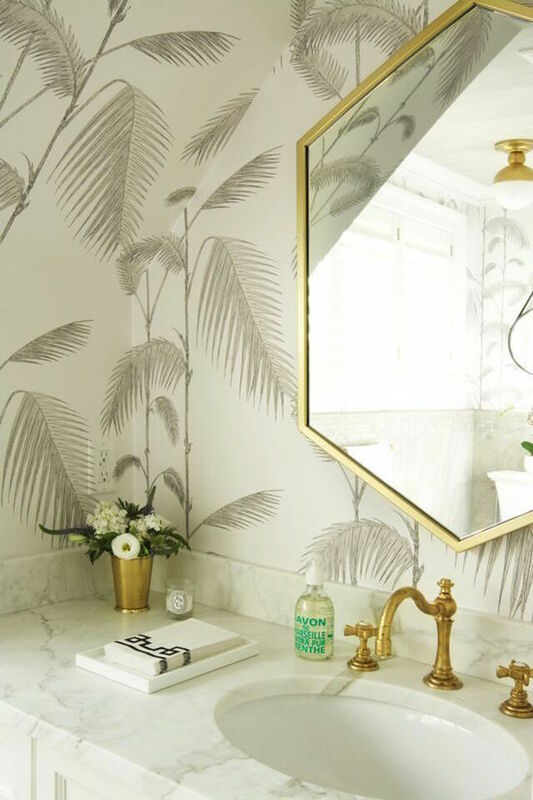 So elegant with the touches of brass and I love the wallpaper! Beautiful!!! This wallpaper may be my new favorite thing EVER. I love the way you used it here. The hexagon mirror is the perfect shape for that spot too. Divine!! That wallpaper still just takes my breath away. It looks so great with brass! Beautiful bath. 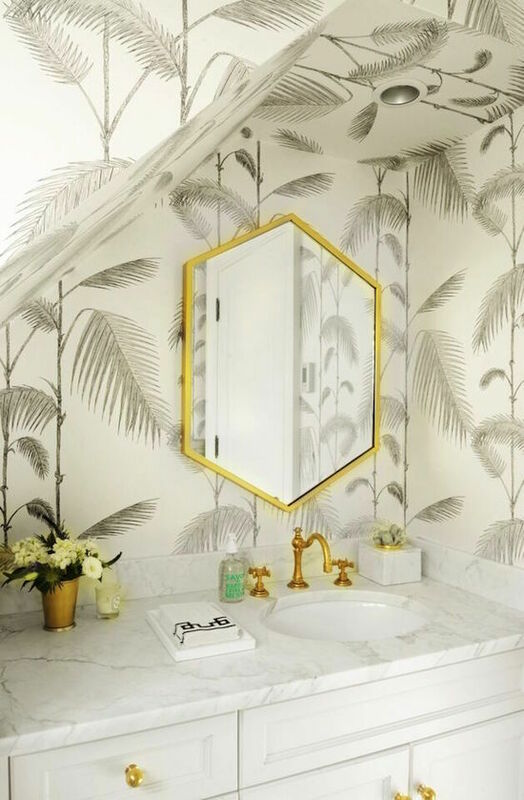 Love the wallpaper and that lovely mirror. Well I love everything about the space!! That wallpaper is definitely a hero in my books. Looks amazing!! What a creative way of "masking' those awkward lines, the wall paper is perfect! Really lovely! It came out great Sue. Love all the brass. I've just ordered a new brass faucet for our downstairs powder room, very similar to this one. You didn't say where you got the brass towel bar? Could you let me now the source? Would love to see if it might work in our BR too.